Gammon cooked in Coke? Sounds like a cringe-worthy combination (believe me, the first time Jo tested out this Nigella Lawson recipe on me, I too was skeptical). But if you dare to take a leap of faith and try this out, its a match made in heaven thats oh so simple to cook. And I guarantee you, once you’ve tried it, there will be more than one sequel to this roast dinner. The science behind it is simple. Gammon on its own = very-salty. Coke on its own = much-too-sweet. Slow Braise the gammon joint in Coke and the Cola will not only draw out the excess salt from the ham, but will infuse it with that lovely caramelised sweetness most of us fell in love with since our childhood days. The black cherryconserve-maplesyrup-sweetmustard-glaze is a twisted adaptation to the one used by Nigella, but it works a charm when its had a final 20 minute blast in a very hot oven to caramelise and finish the cooking process. Bring the Coke to boil in a large stock pot and reduce to a low-medium simmer. Throw in the onions and gammon joint and cover with a lid. 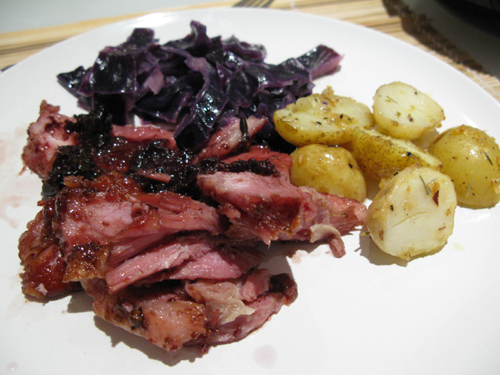 Braise the Gammon for 55 minutes per kilogram (+ a fixed bolt on 30 minutes irrespective of weight). The one kilogram joint we cooked for Christmas took just under 1.5 hours in the pan. 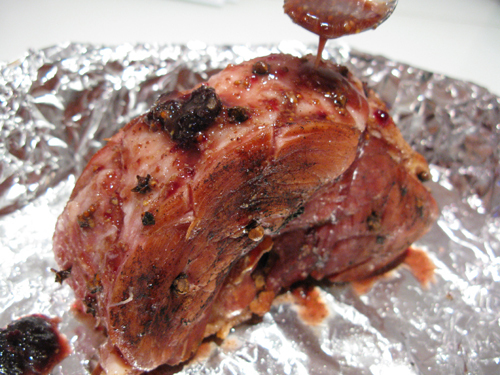 Once the braising is complete, preheat the oven to 220°C and remove the gammon joint from the cooking liquor. Carefully peel off the thick rubbery layer of gammon skin (leaving a thin layer of fat) and score the layer of fat in a criss-cross pattern. Stud with cloves and pour over the combined glaze ingredients. 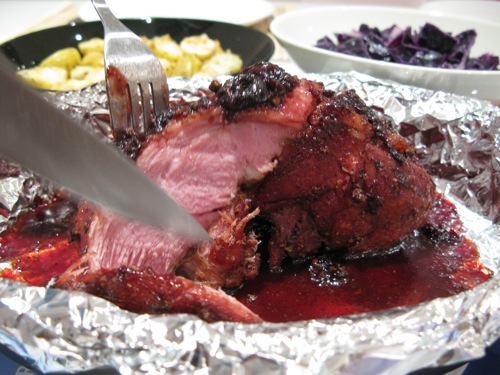 Blast for 20 minutes in the oven to caramelise the glaze and leave for 10 minutes to rest before carving up the beauty (braise roughly chopped red cabbage in the ham’s cooking liquor and prep your spuds in the meantime). There is absolutely no better way to use up those 2 half-drunken bottles of flat coke that have been sitting on the kitchen counter since the last house party. Merry Christmas and a Happy New Year to all! My mum’s always boiled her ham in beer! Before studding with cloves and glazing with tinned pineapples. i remember this from last year!! loved it!